Twenty years ago! Yikes! 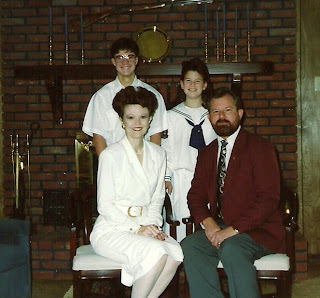 Pictured above is me with my Hubby and children in 1990. Well, first of all, I suppose that I actually thought that my hairdo was becoming at the time. Heaven's, I hope I did, surely I would not have otherwise had such a "do." Looks just like a mushroom sitting on top of my heard. 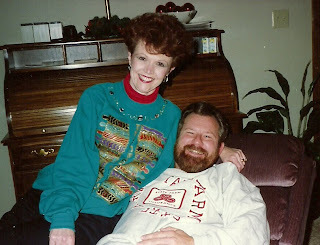 ~double chuckle~ Aside of that, Hubby and I neither one had one grey hair and I was not coloring my hair at that time. What does that mean? Guess it means that today we are 20 years older, and Hubby is completely grey and I have a really good hairdresser! 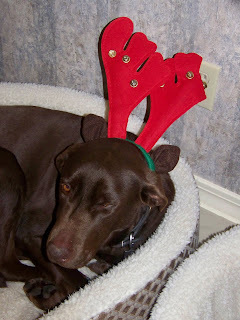 The picture below was taken this past Christmas. WOW! Now, on a more serious note.........We lived in the very same house that we live in today. My husband continues with the same job that he had at that time and we were parents to an 11 year old daughter and a 14 year old son. We were in the middle of making a decision regarding our children's education that was very tough at the time. They were attending a private school here in our city but we were feeling that perhaps we should move them to a private christian school in a nearby city. I well remember the late night discussions that Hubby and I had and the prayers we prayed seeking God's direction in the matter. We ultimately moved them and knew instantly that we had made the right decision. They went on to graduate from that school. I had been overseeing the care of my paternal Grandparents (they were in a nursing home here) for about 18 months, 20 years ago. Each week brought new challenges and responsibilities regarding their care. Little did I know at that time that this would be an 11 year long commitment. I am a little amazed looking back that I handled it as well as I did. But, somehow they were just a part of each week and I have mostly only fond memories of those years of overseeing their care. 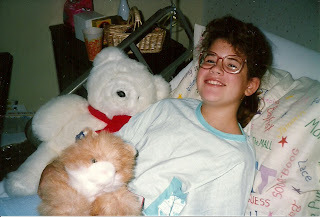 Our daughter was diagnosed with a serious kidney issue and had to have major kidney surgery in the fall of 1990. The Doctors had told us that she might loose one of her kidneys in the process and we were most anxious as they wheeled her off to surgery. The Lord was gracious and she had a complete recovery with no problems and had complete use of both of her kidneys and has never had another problem. That same surgery today is performed through a laproscope and there is little to no down time. WOW! what advances we've seen in the medical field in the last 20 years. Hubby and I were just doing our best to keep our pre-teen daughter and teenage son with a focus on God and His will for their lives. We did lots and lots as a family unit and were always blessed that they never minded being with us and most often even considered us to be "pretty fun parents." They were involved in the Youth Ministry at our local church and we were always ready to help with their activities and trips as needed. I cannot say enough about how important I feel a thriving Youth Ministry is to a teenager. How is my life different today? Oh, my.........there really isn't any comparison. The children grew up, went off to college, married and have now blessed us with two Grandchildren. So, our nest was emptied, and while there was a sadness that went along with it, there was also a feeling of relief. We were entering a new season of our lives and we looked forward to what the Lord had in store. Both Hubby and I lost our Mothers in that time frame and that definitely left a void in our lives that will never be filled by anyone else. I can't really say that my life is any different than I thought it would be. I don't know that I really thought about the future all that much at that particular time. But, let me assure you, I do now. I often think not just about the next 20 years, but the next 10. Not with worry, because I know that whatever comes our way that the Lord will give us the strength to face it, just as He has in the past. Praise God for that assurance! Let me close with one last picture and one last laugh! Before I get started on this entry, I want to say how much fun it has been to get to know some of you Company Girls in recent weeks. I think "blogging gals" are just some of the best in the country. Do I hear an "amen" to that? I'm inspired by many of you young Moms that are doing your very best to be Godly Moms as you balance your extremely busy lives. I have a 30 year old daughter and daughter in law that are right where many of you are, so I applaud you and want you to know that your efforts will not go unnoticed. 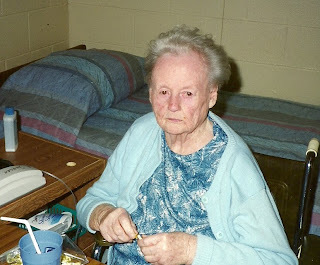 My paternal Grandmother (pictured above in 1992) was a character to say the least. She was the most fun Grandmother and when her Grandchildren were around, nothing else mattered. Well, really, nothing else mattered whether or not we were around, but that's another story. She could do string art, play the harmonica, loved to play dominos and believed in a lot of old "wives tales." Needless to say, all of that was most entertaining to me as a child. For the first 10 years of my life, we lived near my paternal Grandparents and I always looked forward to staying the night at their house. In those days, there were nothing but double or twin beds and my Grandmother slept in a double bed and my Grandpa slept in a twin bed. They were in the same room, but nonetheless, they had separate beds. ~wink~ My Grandmother was a rather large woman and I absolutely loved to snuggle up to her as I fell asleep. 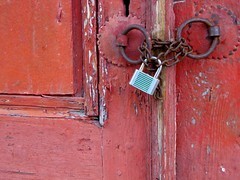 I can still remember the secure feeling that it gave me. 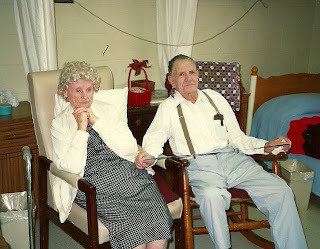 In October of 1988 my Grandparents (pictured above around 1988) reached a point where they could no longer live alone. My Dad's sister had passed away at a young age and that left him an only child. My Grandparents lived in Ft. Smith, Arkansas and my parents lived in Lynchburg, Virginia. Not a real workable arrangement for caring for my Grandparents. After prayer and discussions the decision was made to move them to Louisiana to a nursing home near me. They did not want to leave Ft. Smith (and rightfully so) but they did agree that they would come here since it wasn't near as far from Ft. Smith as Virginia. I had some connections with the Director of Nursing at one of our local nursing homes and she made arrangements for them to come and reside there. I shall never forget the day that we moved them in and the sadness that overcame my Dad, Mom, brother and myself as we left them that first night. The years that followed were years filled adjustments, many ER visits, laughter, sadness and lots and lots of memories. I believe the national average for folks living in a nursing home is 18 months. Well, my Grandparents broke that average by a long shot. My Grandpa lived until 1992 and passed away at the age of 88. We just knew that my Grandmother could not last that much longer. After all she and Grandpa had been married 68 years and we felt like she would ultimately grief herself too death. Wrong!! She lived on for 7 more years and died in July of 1999. We were blessed that both of them ultimately just "wore out." They did not have any long and extended illness and , except for some short term memory loss, they were able to keep their minds in tact. Life was very different for me when they both were gone. I had watched over their care for 11 years and it was a real adjustment when they were gone. I always remember my Grandmother growing African Violets in her kitchen window. I especially remember the bright purple blooms on many of them and she grew them in coffee cans. Yes, that's right, old rusty coffee cans with holes punched in the bottom of them for drainage. The kitchen window was almost always raised and they were exposed to the rain, the wind, the cold, the heat, and they always thrived. A fact that is amazing to me now. At some point I shared this fact with a dear friend and when my Grandmother passed away she remembered the "African Violet story" that I had told her. So, shortly after my Grandmother's death the local florist comes to my front door with a beautiful basket filled with two African Violets. I did think they were beautiful and I knew immediately why she sent them. But, I had no idea what I was going to do with them or how I would ever keep them alive. Who knows, maybe I'll still be growing violets when the Lord calls me home and perhaps my daughter will want to continue growing them in my honor. ~smile~ And, maybe I've caused you to want to "try your hand" with African Violets. I cannot remember when I first heard of Mardi Gras, but I have been a Louisianian for 38 years and it certainly hasn't been that long. Probably more like 20 years. Perhaps I heard of it, but never in detail, so I had no idea what it was. Over the years I've researched and read a lot about Mardi Gras and while many people associate it with a wild and partying occasion, it doesn't necessarily mean that to everyone. It can pretty much be whatever a person wants it to be and I choose for it to just be a time of fun and happiness. I've always been intrigued by the King Cake and have always wanted to "try my hand" at baking one. But, it always seemed like more of a baking challenge than I wanted to tackle. Our Thursday's paper had several recipes for a King Cake and one of them caught my eye. It seemed like it might just be "doable." So, thought I'd share my experience with you. It was suppose to be rolled into a rectangle, not an oval, but......... I now know that's why I had issues with the braiding, uneven ends. Just won't work! But, I will make sure it is a rectangle the next time I make it. Don't you just love the look of that cinnamon sugar! Here it is, iced with the purple, yellow and green dyed sugar sprinkled on top. I thought that the icing covered a "multitude of sins." Now, let's cut into it and see what happens. Looks pretty decent I'd say and who better to "try it out" than dear friends. And, what dear friends they are, they were impressed and ate the whole piece! So, I'm saying my first King Cake was a success, but I learned a lot through this first try and am expecting my next one to be even better, maybe not in taste, but definitely in looks. ~chuckle!~ Now, whether or not you have learned anything, I would say that you have probably been entertained by this entry. And, I forgot to say, I have never figured out why they are called a King Cake rather than King Bread. I mean it's really nothing like a cake, mine was more like a HUGE cinnamon roll and any that I have ever eaten was more like a bread. Oh, well, doesn't matter, I just wondered. I cannot remember having as "laid back" a week in a long time. It has been so refreshing and relaxing. I feel almost lost without anything that I HAVE to get done. I do enjoy being busy, but do not like to be overly busy for extended periods. I like to have time to "be still and know" and I've had that this week and am so grateful for it. Of course, often, our weeks are just as busy as we will allow them be. Sometimes it can't be helped, and others, well, you know what I'm saying. I made a pot of white chili (recipe on the back of the McCormick's White Chili seasoning packet) one day for dinner and then last evening I made a big pot of pinto beans and grilled a pork tender. I wish I could tell you that I cook every day and that we have a wonderful meal each evening for dinner. But, I cannot lie. Since it is now just Hubby and I, we often go to the local "dive" and grab a bite. Often, it's just for the sake of having something to do when the days are so short. I bet you younger folks are reading that and thinking that you cannot imagine going out to eat just to have something to do. ~chuckle~ Hang in there, your day will come! I have almost finished going through and storing memoribilia from my Mom. I love the feeling of completing a project! Yea! I love Valentines! A couple of weeks ago I decorated my kitchen island with a couple of "Valentiney" items. I certainly don't go all out with decorations, but like to keep something seasonal on the island for us, and anyone who drops by, to enjoy. Inside the glass cylinder is conversation hearts (such as we use to eat) surrounding a red candle. I have a heart shaped wreath hanging on a wrought iron hanger and then my Mark Roberts Valentine fairy hanging from the ceiling fan pull above the island. I'm not sure you can tell just how cute he is, but take my word, he really is cute! ~smile~ I have seen the Mark Roberts fairy collection for years but this is my first one to own. I think he will be something that my Grandchildren will enjoy when they are a little older. Speaking of Grandchildren.......I had the privilege of keeping our Granddaughter yesterday and enjoyed her so much. She is growing so fast, almost 12 pounds now, and has the cutest little "belly laugh" that I love to hear. We rocked and talked and had a good time. All too soon she will be grown, so I cherish these times to "love and cuddle" her. Good Afternoon, I'm enjoying a cup of Cranberry Iced Tea from Sonic. I do hope all of you have a Sonic nearby. There is just nothing like a Sonic drink! Well, if you don't have a Sonic drink this afternoon, you just grab whatever you prefer and get comfortable and we'll have a little Monday afternoon chat. new step Mom. She has been a fan of Gospel Music for many years and there was a two night event in Monroe that she had tickets for. My Dad had gone the night before and didn't care to go back for the second night, so he called to see if I wanted to go. I do enjoy Gospel Music to a degree, but it doesn't take long for me to "have my fill." But, it has been many years since I had attended a concert and I decided that I would go. It was from 6:00PM until 10:00PM. The guests artists were Guy Penrod, Jeff & Sheri Easter, Triumphant Quartet, Brian Free & Assurance and The Arnolds. 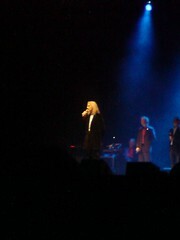 I was especially excited about Guy Penrod, he can "bless my socks off" when he belts one out. Of course, he was last on the program, so I was getting a little weary by the time he came out. But, all in all, in was an enjoyable evening and I certainly enjoyed the time spent with my step Mom. She is a super great lady that already holds a special place in my heart. 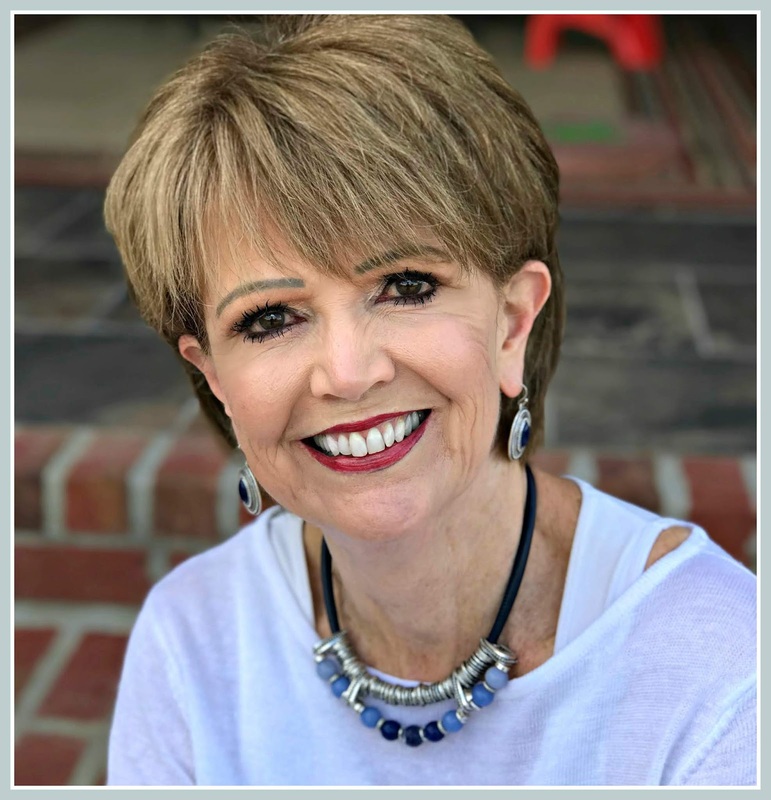 Last evening was the beginning of our Beth Moore Bible Study, "Living Beyond Yourself. We had about 30 women out of the 40 that has signed up present. And, I had heard from about 7 of the 10 that were not present, so it was a great start. Of course, if you have ever done a Beth Moore study, then you already know how wonderful her studies are. She introduced us to the study last evening and built such an excitement among us as we all look forward to "Living Beyond Ourselves." One statement that Beth made last night really stood out to me, it was that, "God has called us to live far beyond what we are able." And, through the infiltrating power of the Holy Spirit, I can.....do things I couldn't, feel things I didn't, and know things I wouldn't. 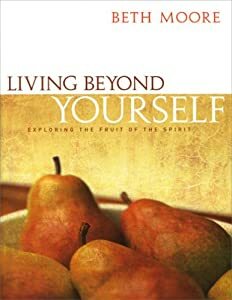 A big part of the study is the homework and I look forward to spending time in God's Word delving into the Fruit of the Spirit as I learn to Live Beyond Myself. I've enjoyed our visit, but think I'll go over and get a little "snuggle time" with my precious little Granddaughter. Happy week to each of you! First, it has been so much fun to be a part of The Company Girls. 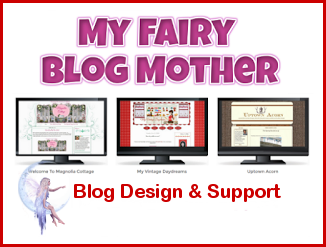 I've made some new blogging friends and so enjoy checking out their blogs. I've even had some comments from 2-3 of The Company Girls and I thank you so much. We Company Girls must stick together! Right? What a beautiful day it is here in the South. It has actually gotten up to 47 degrees today. Now, my poor pansies look as though they need the temps to get up to about 75. They are pitiful!! But, I have faith to believe that they will resurrect in a few days. I've had them with ice covering them before and they always survived and came back in full array. I decided to take off to Monroe again today and try and begin my search for a decorative rug to go in our family room. We've always just had carpet (cut and bound) to go over our wood floors, but I thought that perhaps a decorative rug would add more warmth to the room. Of course, the co-ordinating of a decorative rug is much more time consuming than just simply having carpet cut and bound. But, I'm up for the task and decided to begin today. I went to the furniture store that we have been doing business with for 25 years. I knew they sold rugs and could likely order the size that I need. I put a pillow from our couch and a pillow from the two matching chairs in a bag and off I went. I had no other mission in Monroe except to go there and hopefully find just the perfect rug. I pulled in the parking lot, jumped out of my vehicle and went and firmly grabbed the door to walk in. Well, I almost pulled my arm off because the door was locked. I looked at my watch and it was 9:45AM, they open at 9:00. I thought perhaps they had just forgotten to unlock this particular door and then I looked at a sign plainly posted in front on my face, "CLOSED TO PREPARE FOR INVENTORY REDUCTION SALE, REOPEN ON THURSDAY." Oh, my goodness, I couldn't believe it. I returned to my vehicle, reminding myself that the end of the world was not at hand and that it really would be okay. Then decided that since I had nothing else to do in Monroe, I would just go by and check out Tuesday Morning. I have not been there in 3+ months and it's a fun place, to me, to just go and wander through. So, off I go. I parked, walked up to the door, grabbed it and again, almost pulled my arm off. This time I looked to see if there was a sign first thing. And, sure enough there was. This one said, RESTOCKING, CLOSED UNTIL FEBRUARY 15TH." I decided that it was time to head home. I really had a good laugh and came home to work some more on the upcoming Bible Study and my continuing going through some of my Mom's things. I've pretty much gone through everything, except the pictures, and have been making labels for a lot of the things so that my children will know some of the various facts about the items. My Mom had labeled many of the items and I am so appreciative of that. Her honeymoon negligee was in a ziploc bag and I don't know if I would have figured out what it was or not had it not been for the note she had pinned to it. So, I in turn, remade the label with a bit more info. Some of the things I have found in this process are: the baby's book of Dad and Mom's first baby, a little boy, that died at 2 days old, the topper off of their wedding cake, and a slip handmade by my Mom when she was a teenager. Since going through these items and finding the notes my Mom had attached to them over the years, I decided that I should be doing the same. So, I have gone back to some things that I have stored and labeled them so that my children won't have to scratch their heads wondering what something is, or where it came from or what it means. You might find this a good suggestion too. I wish that I could thank my Mom for taking the time to do this over the years. 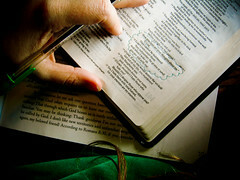 The Bible verse sitting before me today is, "I choose to cast my cares on You, Lord, and You will sustain me." Psalm 55:22 NIV What assurance to know that He will sustain me, no matter what may come. May all of you have the happiest of weeks! First, let me say a big "thank you" to those of you who posted comments on my last blog. Can I just say that "you made my day." I know, doesn't take much to get some folks excited. ~smile~ But, as I said, it lets me know that you read my blog. A big hug to you all! What have I been doing today........well, I ran to Monroe (about 22 miles from here). I really had to talk myself into going. It's really cold and I just didn't want to get in and out of my vehicle. But, I had items that needed returning and then thought while I was there, that I might as well check out a few sales. But, I was so proud of myself. I only bought one item . I'm still learning that just because something is on sale, it doesn't mean that I need to buy it. But, when things go below 50% off, it just seems really easy to justify it. ~laugh~ I'm learning though and truly asking the Lord to make me mindful of such things. Speaking of things..........when I got back from town I ran over to my Dad's house. He has recently remarried and he and his new bride are living in her house. So, he is trying to get his house ready to sell. Well, that has been such a task and he has done most of the job by himself. He and his wife are using some of the furnishings, but even after they got what they were going to use, there was still all kinds of stuff to get rid of. And, I must say that my parents were never "collectors of stuff." Since my Dad was in the ministry they moved a lot and moving helps to get rid of "stuff." So, he really doesn't have a lot of useless stuff. But, useful stuff, yes! Oh, my! He told me to come and get whatever I desired and I did, but it was just 4-5 items. I simply do not need any more furniture, my kitchen is full of all I need in it and on and on. My Mom had lots of photo albums and loose photos. While I do not know what on earth I will do with them, I simply could not just let them be thrown away. I have them set aside for now, but little by little will go through them and keep the ones that I feel are worth keeping and then I guess I will throw the others away. Oh, the beauty of digital pictures!! Watching my Dad go through this "ridding process" has really caused me too think about what our children may one day face. But, can't dwell on that, they will just have to decide what they want and don't want. I guess all parents wish that their children would never have to face such decisions, but that is pretty much a part of life. Many of you "Company Girls" are still young enough that none of this has likely ever entered your mind. That's okay too! What got my attention today? I don't know if any of you have heard about the lady that lived her life "according to Oprah" last year or not. But, I heard about it on one of the news shows yesterday and then read an article about it in the newspaper last evening. It saddened me so ! Now, she has written a book about the experience and I would almost bet that it will be a #1 best seller. Oh, my, can't even imagine the shallowness of such a life. Well, try to stay warm, since I feel sure that wherever you are located, you are likely enduring some rather frigid temperatures. I can already tell that the clouds are moving in here and so I'll begin to mentally prepare myself for no sunshine tomorrow. Shucks! I feel like today is really the first day of the New Year for myself. I've been so busy getting things back in order from the Christmas celebration and family visits that I hardly realized that the New Year had even arrived. Hubby and I slept right through it's entrance. 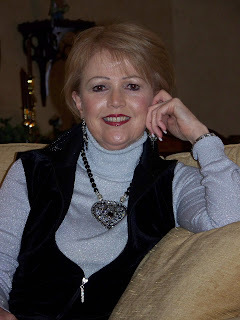 In reading some other blogs that I've become attracted to, I notice that many of you have been some busy ladies too. Some of you are young Mothers with small children and I so enjoy reading about your lives and how you balance it all. While I'm glad to have that behind me, I look upon those years with precious memories. And, while I'm sure there are days that you wonder if your children will ever grow up (and do know, it's really okay to have those feelings at times) I assure you that you will not turn around twice and you'll be sitting right where I am. The nest will be empty and then you will take on more, such as daughter in laws, sons in laws and grandchildren. ~smile~ But, the good thing is that they will have their own homes and you will no longer have the full responsibility of their care. You will still have those "motherly concerns" and they will multiply as your children marry and have their children. Isn't it great that we have a heavenly Father to take those concerns to and then sit back and allow Him to do His work in their lives. He really doesn't need our help! I'm constantly having to remind myself of that fact. I'm praying for a much calmer year and less eventful year. I was in such grief over the death of my precious Mom for most of last year and experienced many a dark day. But, the Lord walked me through and I can honestly say that I now KNOW I have come through the darkest of days. There will always be moments, but not a consumption of grief. The high note of the year was the addition of a precious Granddaughter. 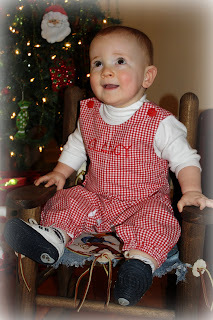 She was born almost one year after our first Grandchild, a little boy, was born. So, we feel blessed to have one of each at this time. Yes, it was a year of emotional highs and lows. the New Year than a good Bible Study. I'm praying that the Lord will use it in each woman's life as He sees fit. About 3 weeks ago I opened our mail and saw a piece of mail that I wished I wasn't seeing. It was a summons to serve as a possible juror for court. I have to report to the Courthouse tomorrow at 1:00PM and I am ashamed to say, I hope that I do NOT have to serve. I have so many plans for this week, things that I really think need to get done this week and serving as a juror is NOT one of them. I'm hopeful that when I get there they will just simply say that the case was settles out of court and I can leave. ~smile~ I'll let you know. Today's Sunday School lesson was a great one for the first Sunday of the New Year. I want to share just a couple of points that spoke to my heart. When we search for meaning in life apart from God, we gain nothing from our effort; we will be in a continuous cycle that leads nowhere. Meaning is found only in a God-directed life. May the Lord keep that before me throughout this coming year. In closing, I've been blogging since last March and one thing I have learned is that "bloggers" generally love comments. Now, please, know it's not your compliments I'm seeking, I'm just interested in who is actually reading my blog and if anything I've said might have meant something to them. I know that several read my blog because they've told me so, but I hope you will take the time to leave your comments at the end of my blog. Yes, I know you must register with Google and get a password. But, it's really a painless procedure and you will never have anything to worry about by doing that. And, do know that I always leave some type of comments on the blogs I read, sometimes just a word or two, sometimes several sentences. Okay, ladies, have I convinced you? Time for me to get up off the couch and work on one of my many projects around here. Hubby is kicked back in his recliner watching the ballgame and I may go and kick back in mine for a few minutes. After all, isn't the Lord's Day suppose to be a "day of rest?" 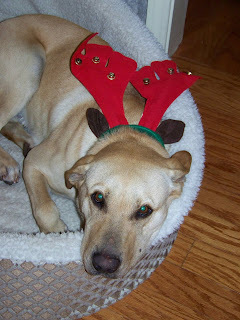 Tommy dressed up as Santa and was warmly received by one Grandchild and not so warmly received by the other. But, didn't he make a good looking Santa? Poppa enjoying some special time with the "Grans"
I do hope a lot of special memories was made by you and your family.